Let me preface this review by saying that I’m not British. But I did grow up in the U.S. in the New England area, which kind of like England, only…newer. We share lots of city names and bizarre pronunciations (Gloucester = “gloss-tah”, Peabody = “PEE-b’dee”). 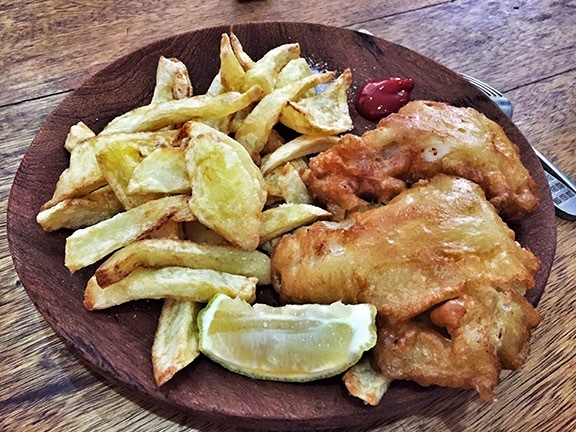 We also share a love for battered and fried Atlantic Cod with a good dousing of vinegar served over a heap of crispy fries — or “chips” if you’re actually from the U.K. So needless to say, after growing up with fried fish as a staple in my New England diet —and experiencing the real thing while traveling in the U.K.— I have been anxiously awaiting the opening of a Fish n’ Chips takeout in Mamelles, just down the street from the lighthouse. Friends, let me tell you right now that this place is LEGIT. Grace opened her door for business this past weekend and I had the privilege of being among her first customers. This is Grace, fish n’ chips chef extraordinaire. She’s Indonesian/British and one of the most joyful, vibrant individuals I’ve had the pleasure to meet. You can find the Fish n’ Chips café in the same building as Melo Bakery in Mamelles, on the road to the lighthouse about 500 meters from the Mamelles roundabout. They’re open Tuesday through Sunday, from 12h00 to 20h00. Come in for fish, grab a dessert at Melo. What’s not to love about this arrangement? The café itself is small and cozy, with one indoor picnic-style table that would seat six comfortably, where you can feel like you’re an old friend hanging out in Grace’s kitchen. Just outside the door are three more bistro style tables, and of course, Grace is happy to wrap up your order to go. There’s not much space for large parties, so if you’re coming with a group, be prepared to order carryout and sit outside on the steps or take it somewhere else to eat. Plage des Mamelles isn’t too far, so why not bring a few beach umbrellas and enjoy an afternoon at the beach with a fresh lunch from Grace? Aside from your beverage options, there are just two things on the menu: fish and chips, ordered together for 4.000 CFA or chips only for 2.000 CFA. The fish Grace uses is Mostelle, fresh filets delivered daily from Marché Kermel. (FYI, “cod” is the generic name for a family of Atlantic fish that share similar traits, namely, their firm, white meat. Mostelle is one type of fish in this family. To say Grace’s fish n’ chips are good would be an understatement. The filets are thick (and ginormous) and cooked perfectly — juicy and flaky, not overcooked with a texture that resembles cardboard. The batter is not overly heavy or overly greasy — Grace fries in sunflower oil (it is fried, though, so I wouldn’t necessarily consider this a cholesterol-friendly meal). But the best thing about the fish was that I didn’t have to pick a single bone out of my filet. Everything is made fresh when you order it, so nothing is sitting out under a heat lamp getting cold and soggy. You can doctor your fish n’ chips up with traditional vinegar or ketchup (although why anyone would ruin a perfectly good piece of fish with ketchup is beyond me). The only thing that could put this meal over the top is if they could score some real malt vinegar…but I imagine it’s hard to come by locally. The chips (fries) would hold their own in any contest around Dakar: thick cut but crispy and not at all mushy. My friend Jesse, who is something of a french fry connoisseur, says they might even top her absolute favorites at Noflaye Beach. No wonder they’re selling them à la carte. Customers can order the usual assortment of drinks: Coca-Cola, Fanta, Sprite, Perrier, Orangina, and so on. There’s also freshly made espresso, or, if you’re a true Brit (or a Brit at heart), you can enjoy a spot of English tea. And all the British expats rejoiced because it’s real Yorkshire tea. Cozy, family atmosphere, a lovely hostess, and a real (delicious) taste of the U.K. Worth the trip and every bit of 4.000 CFA for the best fish n’ chips in town. Located in Mamelles, across from the lighthouse entrance in the same building as Melo Bakery. This sounds de-lush and maybe something we can enjoy on my next trip to Dakar! Ahem, Fish & Chips? Made by Grace? I am so going. Thanks, Corrie, for letting me know about it. Thanks, Kari, for sharing this article.